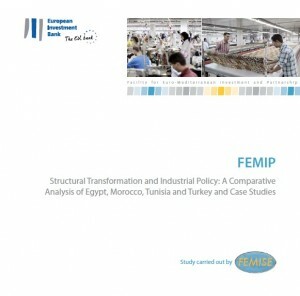 FEMISE published a new study that explores patterns of structural change and industrial policy in four Euromed economies: Egypt, Morocco, Tunisia and Turkey. The study, that was carried out by the Economic Reserach Forum, reveal that overall, the four Mediterranean countries have achieved a certain degree of structural transformation over time; in particular moving from the agricultural-based sector towards services and industrial sectors. Positioning the four countries in terms of degree of industrialization places Turkey on top of the list, followed by Tunisia, then Egypt and finally Morocco with the slowest pace of industrialization; while in terms of export diversification, both Egypt and Turkey performed better than the other two countries. The study underlines that governments in these four countries realize that this transformation is far from satisfactory, this is why we observe that their industrial policies are moving away from sectoral targeting towards regional incentives and in particular to include more ‘’horizontal’ mechanisms such as support to R&D, environmental protection and incentives to SMEs. The study suggests that the focus of these industrial policies should be on the promotion of the high quality activities (increasing returns), which are characterized by steep learning curves and dynamic imperfect competition, technological change, synergy and cluster effects. These policies should also help create new comparative advantages so as not to rely on the low-value existing ones. This should be coupled with investment incentives towards innovative products . The study concludes that industrial policy is not pre-ordained to succeed or fail but the important issue lies on the way they are designed and implemented. This study was carried out by the Economic Research Forum and with the financial support of the FEMIP Trust Fund at the European Investment Bank and the European Commission.